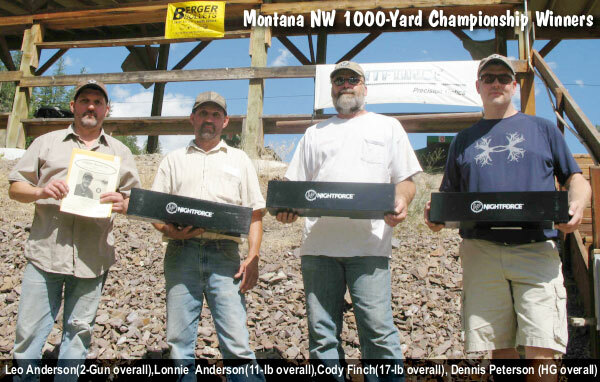 The Montana Northwest 1000-Yard Benchrest Association held its annual Championship match last weekend at the Deep Creek Range near Missoula, Montana. The match drew talent from across the nation. 57 shooters attended the two-day event, and many states were represented: California, Idaho, Missouri, Montana, North Dakota, Oregon, South Dakota, Washington — even Pennsylvania. 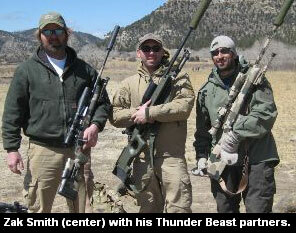 Dashers ruled the roost for the most part, with four of the top five in the Two-Gun shooting 6mm Dashers. Leo Anderson (Dasher) finished first in Two-Gun, followed by Robert Hoppe (Dasher), Mike Thomas (Dasher), Richard Schatz (Dasher), and Don Nielson (6.5×47 Lapua). Leo Anderson also won the Heavy Gun Overall, followed by Dennis Peterson, and Robert Hoppe. Cody Finch topped the 17-pound class, ahead of runner-up Robert Hoppe, with Leo Anderson coming in third. Lonnie Anderson won the 11-Pound Sporter Class, ahead of Scott Nix and Kevin Watson. Montana shooter Tom Mousel, who finished 6th in the two-gun overall, reports that: “It was a very calm, high pressure weekend, so much of the home field advantage wasn’t there. There was some mirage in the 90° heat, but mirage was really quite manageable. The stable conditions made for a very close match, with competitors from outside Montana giving the locals a run for their money.” As usual, the club had a rich prize table — there were over $27,000.00 worth of prizes and give-aways. Highlights for the weekend included Barry Bluhm’s 3.624″/99 in Heavy Gun class on Saturday. Barry, who shots a 6-6.5×47 Lapua, proved you don’t have to run a Dasher to shoot small. Three perfect 100 scores were shot at the match. In Light Gun, Roger Hoppe fired a 100/5.947″ on Saturday, while Mike Thomas got his first perfect score with a 100/6.664″ on Sunday with his Light Gun. Deep Creek Ace Leo Anderson nailed a 100/5.432″ in the Heavy Gun class on Sunday. Light Gun: 6mm Dasher, Stiller Viper drop port, Lawrence rifle barrel, Nightforce scope, Shehane stock, metal smithing by King Machine. Heavy Gun: 6mm Dasher, Stiller Viper drop port, Lawrence rifle barrel, Nightforce scope, Bangeman stock, metal smithing by King Machine. Light Gun + Heavy Gun (Dennis shoots one 17-pounder in both): 6mm Dasher, Defiance action, Lawrence rifle barrel, Nightforce scope, Shehane stock, smithing by Jeff Lawrence. Match Sponsors Included: Bartlein Barrels, BAT Machine, Berger Bullets, Brownells, Burris, D&B Supply, Defiance, Dewey Mfg., Forster Products, Hodgdon Powder, Ron Hoehn, Lee Precision, Leica, Krieger Barrels, Lilja Barrels, Don Nielson, Nikon, Pacific Tool & Gauge, Pro-Shot, Sierra Bullets, Sure-Fire, Swarovski, Vortex Optics and Zeiss. Share the post "Big Turn-Out at Montana Northwest 1000-Yard Championships"
This fall, November 4-6, 2011, a new two-man tactical challenge match will be held at the Blue Steel Ranch in Logan, NM (site of the popular Steel Safari match). Sponsored by Competition Dynamics and Thunder Beast Arms, the 2011 Thunder Beast Team Challenge (TBTC) is a 3-day, 8-stage test of practical field rifle shooting and related skills. This will be a physically-demanding match! Two-man teams must navigate rugged desert terrain, recognize, locate, range, and engage multiple rifle targets from challenging shooting positions, and complete the 8-stage course under daily time constraints. Most targets will be steel plates, set at distances from 100 to 800 yards. The TBTC is being run by Competition Dynamics, whose staff has a proven 10-year track record as practical field match organizers. Zak Smith is Match Director. The TBTC will be held at the Blue Steel Ranch, a private ranch near Logan, New Mexico. The Blue Steel Ranch, which also hosts the Steel Safari, offers some of the best geography for field shooting available anywhere. 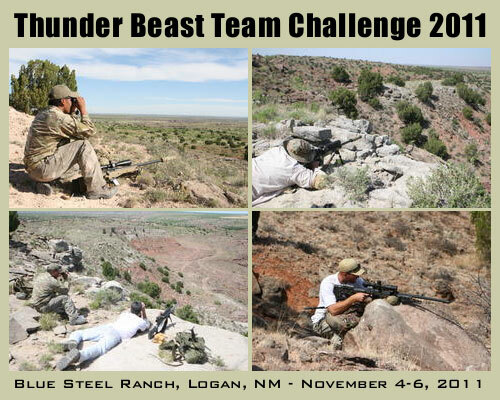 The Thunder Beast Team Challenge costs $585.00 per team. To register, or to learn more about the match, visit the 2011 Team Challenge webpage. Or, email thunderbeastarms [at] gmail.com. Share the post "New 2-Man Team Challenge in New Mexico This Fall"